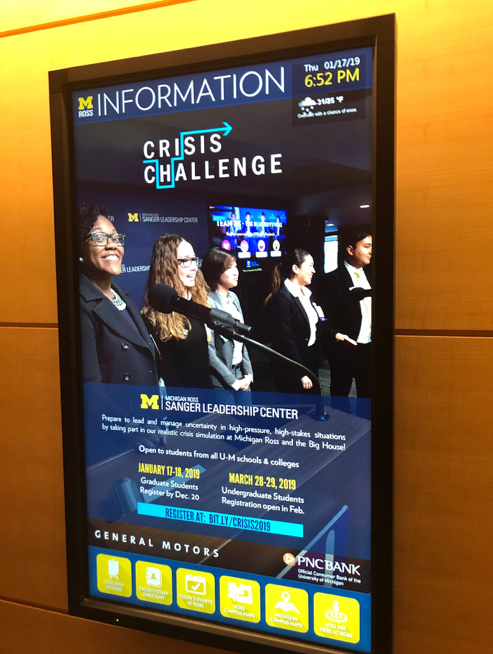 Every year, the University of Michigan Sanger Leadership Center runs two high pressure business simulations for student teams, called Leadership Crisis Challenges (LCC). In these simulations, student teams play the roles of senior business executives who find themselves in the middle of a business and media crisis that unfolds throughout one night. The teams receive new information in the form of emails, phone calls and social media updates as they go through the simulation and have to evolve their strategy and responses on a dime as the crisis progresses. Facilitators play roles in the simulation as well, adding to the drama of the event. The next morning, the teams show up at Michigan Stadium to present their final strategy for handling the crisis to a board of directors. It’s an intense and exciting process, and a tremendous learning opportunity for students. ViewPoint had already been used in a variety of different contexts before the Sanger team started working with Academic Innovation, but the LCC presented some opportunities for developing new features to enhance the functionality of the tool. 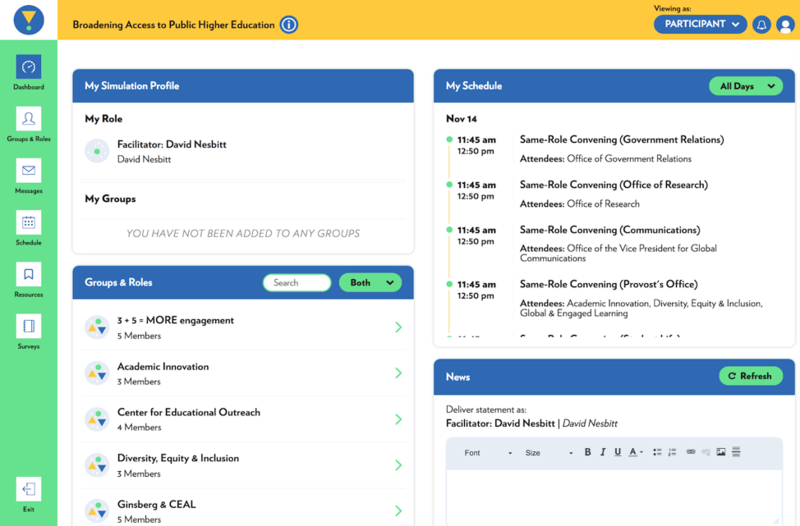 Using feedback from the Sanger team, Academic Innovation added a queued content feature to ViewPoint, which allowed organizers to schedule content like emails, resources, and social media posts to be delivered to participants at a particular time during the simulation. This change meant that the Sanger team could script out the simulation ahead of time and queue up content days or weeks in advance to deliver automatically during the live simulation, instead of having to send content manually during the event. The Sanger team also wanted to run, not just one big simulation, but instead have each of the 30 student teams interacting in their own simulation. To allow this, Academic Innovation developed new functionality so that ViewPoint could run multiple concurrent simulations, and also created a dashboard that allowed Sanger’s facilitators to navigate between the many simulations and play different roles in them, all within a single interface. A screenshot of the ViewPoint interface. On the opening evening of the event, the students logged into ViewPoint and were assigned to teams, and throughout the evening received live updates about the crisis through the platform. Voicemails, news articles, and emails flooded in, forcing the teams to quickly build strategies and react to the new information. As the Sanger team and their facilitators worked to manage all the details of the event, Hayward was on hand to support them in their use of ViewPoint. The event wrapped up on Friday with the announcement of the winning student team, and in the end the Sanger team had pulled off another successful LCC. 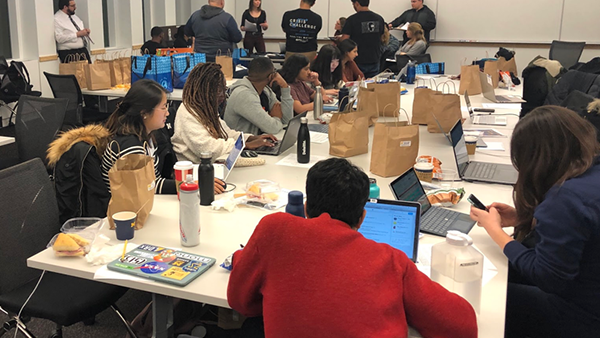 And this time, ViewPoint and the Academic Innovation team had helped them create an even more immersive and engaging experience for the students who participated. With the January LCC event behind them, the Sanger team and Academic Innovation didn’t waste much time before getting back to work together. 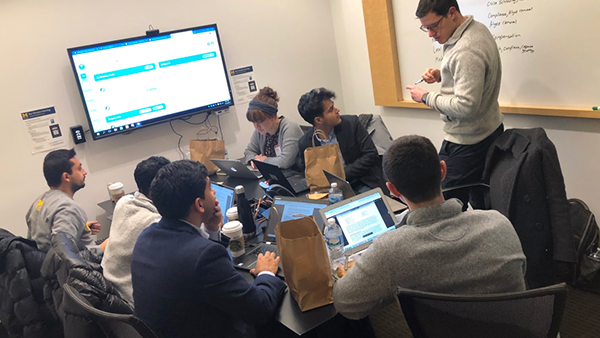 The Undergraduate Leadership Crisis Challenge is coming up on March 28 and 29, and Academic Innovation is already working on the next improvements to the ViewPoint site that will help the Sanger team run an even better simulation, based on the insights gained from the January LCC event. Now that the simulation is already built out in the ViewPoint platform, the Sanger team can make modifications to it and re-run it, without having to fully recreate it each time they run a LCC event. Sanger’s organizers and facilitators working in the War Room, their headquarters for the simulation. Moving forward, Academic Innovation is eager to continue collaborating with partners like Sanger, both to help partners achieve their goals but also to guide and inspire further development on Academic Innovation tools like ViewPoint. “When we get to combine the content expertise of our partners like Sanger with our technology, we’re constantly learning about new ways that our technology could evolve next to address new challenges and use cases,” says Hayward.